Sure, your first thought when reading or hearing the word “overseeding” might be “that’s bad”. But there are times when overseeding can be beneficial to a lawn. Some warm-season grasses need to be overseeded. We’re talking about grasses like buffalo grass, Bermuda grass, zoysia or St. Augustine grass. So why overseed? It will help you grow a thicker, greener lawn that is more resistant to damage and disease. It’s important to understand overseeding before you actually overseed. Overseeding is the process of planting grass seed into existing turf without tearing up the soil. In short, spreading grass seed over an existing lawn. It’s a concept that’s been around for years. So what are some of the other benefits to overseeding lawns? · Overseeding lawns in the fall can cut down on the chances of developing crabgrass, foxtails and other weeds. · Overseeding lawns in the fall gives your grass a head start on a great spring. The new grass will have a few months to become better established before the truly cold weather sets in. There is some preparation to be done before overseeding your lawn. You want to mow your lawn before seeding. Mow it lower than usual. This will help promote contact between the soil and the new seeds. 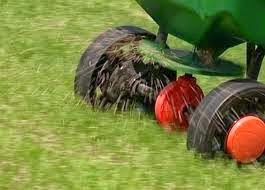 You’ll likely need a lawn spreader for overseeding. If you don’t already own one you should be able to rent one. Check the back of the bag of grass seed you bought. It should have information on recommended overseeding rates. The grass seed will also need to be watered properly, in order to germinate. Your soil should be kept evenly moist. This could mean several rounds watering a day for a few weeks. This is where having a lawn irrigation system could come in handy. You can set the timer to water the lawn at specific times of the day.